KTM exited the higher displacement supersport range after the company discontinued the RC8 without a successor. Currently, the company’s fully faired motorcycle portfolio comprises the RC125, RC200, RC250 and the RC390, which are the fully faired versions of the 125 Duke, 200 Duke, 250 Duke and the 390 Duke respectively. The KTM RC790 render imagines the 790 Duke with a full fairing, underbelly exhaust and an exposed sub-frame. While there is no confirmation about the possibility of a middleweight supersport from KTM, we asked our render artist to create an RC tagged 790. If the RC790 comes into existence, it would use the same underpinnings as the Duke 790. Thus, you would find a tubular steel frame that uses parallel twin engine as a structural and dynamic pivot point. The sub-frame is bolted to the chassis – a feature that we also see on the new 390 Duke (2017 onwards). The cast aluminium sub-frame also houses the airbox. The 790 Duke does not feature any panels to cover the sub-frame, and a similar design trait has been retained on the RC790 render. The new RC range will get a revised fascia that, as seen in the spy images, could resemble the RC8 styling. Thus, expecting similar design traits on the RC790 would not be entirely incorrect. We may see vertically stacked LED projector headlights on the fully faired model. The front blinkers, similar to KTM’s current RC range, would be integrated into the rear-view mirrors for a cleaner look to the fascia. The cockpit would retain the full-digital display from the 790 Duke. The instrument console on the roadster comes with smartphone integration via Bluetooth to control various features such as music and calls on the go. The RC790 could get a slight revision with the inclusion of lap-timer and ride statistics that record the maximum speed, braking pattern and the lean angle of the motorcycle. The 790 Duke style instrument console will also be retained on the RC variant. Being an RC tagged product, the motorcycle will be equipped with a full fairing for enhanced aerodynamics and wind protection. KTM is known for creating purpose-built bikes, and the RC range is designed for the racetrack. Thus, behind the cockpit would come a clip-on style handlebar for sportier and aggressive ergonomics. The render imagines a muscular fuel tank that draws inspiration from the upcoming RC390 test mule. An aircraft-style gas fuel tank cap will sit at the centre although we feel that an asymmetrically placed unit would look more appealing. Hit us with your views in the comments section below. The split style step-up seat in the render retains the same design as the smaller RC range of motorcycles. Thus, you would find a compact rider saddle followed by a step-up pillion seat that mimics a rear cowl. The rear of the rendered bike features a LED tail light, accompanied by LED blinkers installed on the fender. The die-cast, open-lattice swingarm from the 790 Duke has is also seen in the RC790 render. We imagined the motorcycle with two exhaust options. 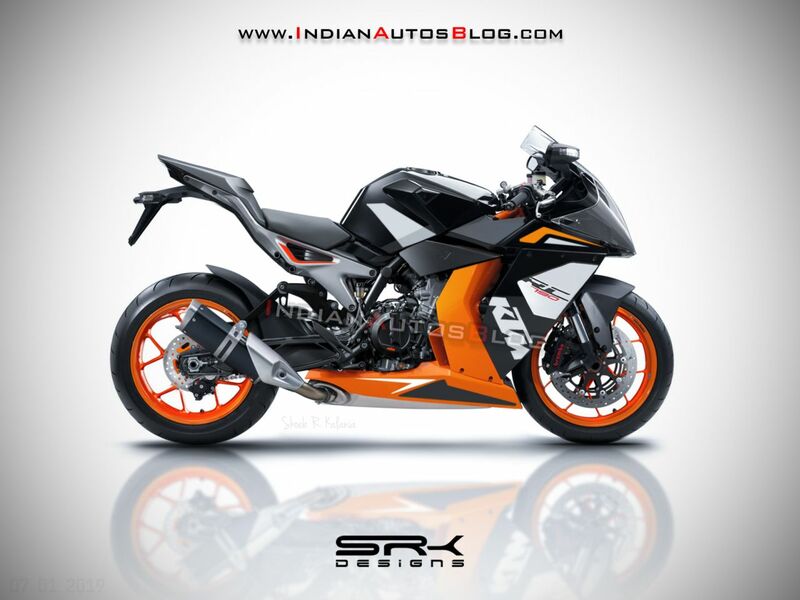 The first uses an underbelly exhaust that was first seen on the pre-BS-IV/Euro-IV KTM RC390 models. The second envisions the RC790 with a conventionally placed unit. The second render (pictured) imagines the KTM RC790 with a conventional exhaust, similar to the smaller RC range. Mechanical specifications would be carried forward from the 790 Duke, and thus you would find a 799cc, liquid-cooled, parallel twin, LC8c engine that delivers 105 PS of maximum power at 9,000 rpm and 86 Nm of peak torque at 8,000 rpm. The parallel twin engine gets a 270-degree firing order along with a secondary balancer shaft to reduce vibrations and offer a V-twin like character. The engine is mated with a 6-speed transmission with a standard PASC slipper clutch. Gearbox also features KTM’s own Quickshifter+ system that works for both, up- and down-shifts. Ride-by-wire ensures an optimal response from the throttle while adding the option of selectable riding modes. The 790 Duke comes with Sport, Street, Rain and Track Mode. The most aggressive of the four, the Track Mode offers a launch control function, variable slip adjustment, increased throttle response. The mode also disengages Anti-Wheelie system. The naked roadster also benefits from KTM's lean-angle sensitive traction control system, Motorcycle Traction Control (MTC). Other electronic aids include Motor Slip Regulation, Motorcycle Stability Control with cornering ABS. All the electronics mentioned above could be seen on the RC790. Specifications in the render continue to use the same hardware as the 790 Duke. Thus, you would see 43 mm upside-down front forks and an adjustable mono-shock – both sourced from WP. Stopping power comes from twin discs at the front and a single unit at the back. If KTM introduces the middleweight RC model, expect it to carry a marginal premium over the 790 Duke. The KTM 790 Duke costs GBP 8,499 - manufacturer’s base recommended retail price - in the UK. That translates to INR 7.57 lakh (as on January 7, 2019). Expect the fully faired model to carry a premium and retail at GBP 8,999-9,499 (INR 8.01 lakh - INR 8.46 lakh). 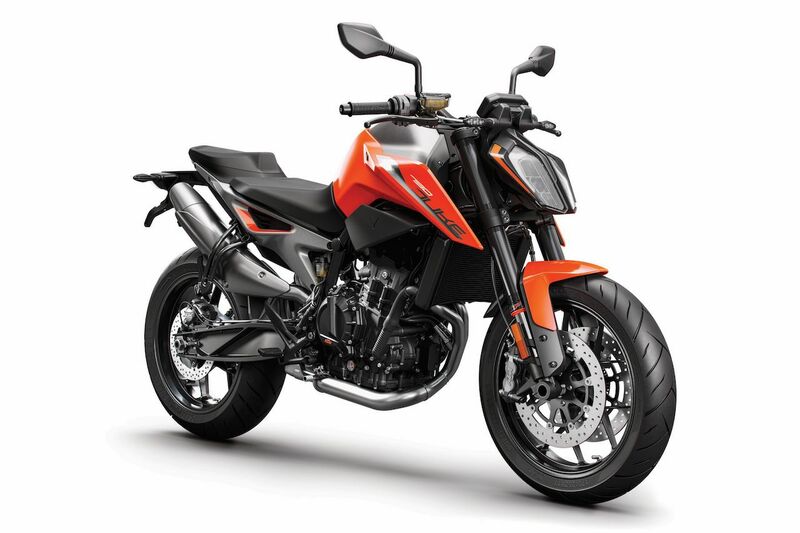 The RC790 would use the same underpinnings as the 790 Duke (pictured) although the fully faired motorcycle will feature different styling and ergonomics. Meanwhile, select dealers in India are taking unofficial bookings for the KTM 790 Duke for an amount of INR 30,000. According to our sources, the KTM 790 Duke will launch in the first half of 2019. That said, KTM India had clarified that the 790 Duke is still under evaluation for the Indian market with no set plans.